Aaron Stanley Tretick (July 21, 1921 - July 23, 1999) was an American photojournalist who worked for All the President's Men. He is best known today for the photographs he took of John F. Kennedy’s 1960 campaign and presidency. In the final issue of Look, in 1971, Tretick was called "President Kennedy's photographic Boswell." Stanley Tretick was born in Baltimore and raised in Washington, D.C., graduating from Central High School in 1940. Following a stint as a copy boy for The Washington Post, he joined the Marines in 1942. Trained as a photographer, he served in the Pacific during World War II and then covered D.C. as a tough-talking news cameraman. Tretick joined Acme Newspictures and photographed combat during the Korean War. In 1951, Tretick's were among the Korean War photos in the exhibit "Korea—The Impact of War" at the Museum of Modern Art in New York. His photo of a soldier crumpled with despair and holding his muddy face in his hands was selected by Military Times as one of the one hundred most-enduring images captured in combat. 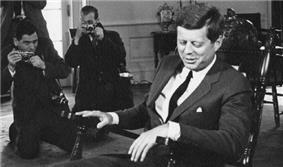 The agency, which became United Press International, assigned Tretick to travel with Senator John F. Kennedy in 1960. Tretick logged more miles with Kennedy during the presidential campaign than any other photographer. The photographer and candidate became friends and Tretick took many important pictures during this time. In 1961, when Kennedy took office, UPI refused to assign Tretick exclusively to the White House. Kennedy told Tretick to get a job with any publication that would, promising him extensive access. On this basis, Look hired Tretick. Stanley Tretick is noted for the photographs he took of President Kennedy with his children. [Tretick's] photographs of [the Kennedys] published in Look from 1961 to 1964, helped define the American family of the early sixties and lent Kennedy an endearing credibility that greatly contributed to his popularity. A 1962 Look cover of Kennedy driving his nieces and nephews in a golf cart, taken at the family compound in Hyannis Port, is akin to the patriotic, illustrative paintings of Norman Rockwell that still graced the covers of the Saturday Evening Post. Tretick's uncanny understanding of the symbolic value of such imagery allowed him to focus on small humanistic moments within the power and politics of Washington. In October 1963, Stanley Tretick took his most famous photograph for an article about the President and his son. While Jacqueline Kennedy was out of the country, Tretick was allowed to join the father and son, walking the halls of the White House and playing together in the Oval Office. 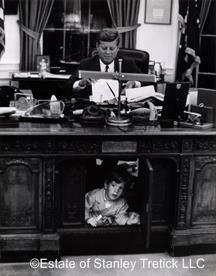 Tretick's photo of the moment John, Jr., popped out from under the President's desk, with Kennedy seated behind, encapsulates the myth of Camelot. When Kennedy was assassinated on November 22, 1963, these pictures were already on the newsstands and helped create lasting memories of John F. Kennedy the man. Tretick also covered Robert F. Kennedy's 1968 presidential campaign. His last picture of Bobby Kennedy was taken as Kennedy was going down to speak to his jubilant supporters after his victory in the California primary. Kennedy was assassinated after making that speech. One of Tretick's photos of Robert F. Kennedy was used for a commemorative stamp released in 1979. When Look magazine folded in 1971, Tretick became a founding photographer of People magazine where he retired in 1995 as a contributing photographer. He covered major stories such as Watergate, Iran-Contra and the Clarence Thomas hearings. He turned down a chance to be President Jimmy Carter's personal photographer. "I didn't feel he wanted an intimate, personal photographer around him," Tretick said. Stanley Tretick died in July 1999 at the age of 77, just days after John F. Kennedy, Jr.'s plane crashed off the coast of Martha's Vineyard. In 2008, the archive of Tretick's photos became available online. ^ Bernard D. Nossiter, "Dio Slugs Cameraman, Repeatedly Pleads the Fifth," Washington Post, Times Herald, 8/9/1957. ^ Contemporary Authors Online, Gale, 2006. Reproduced in Biography Resource Center. Farmington Hills, Mich.: Thomson Gale, 2006.